Labor has been able to do this because of the work they have done on the revenue side, not so much from nixing the company tax reduction, which would only cut in later, rather the changes to negative gearing, dividend imputation, family trusts, retaining the increase of 2% to the top tax rate and other revenue measures. And a refusal to be bound by an arbitrary limit on revenue of 23.9% of GDP. Bowen pointed out that Peter Costello had exceeded Scott Morrison’s speed limit five times when treasurer. 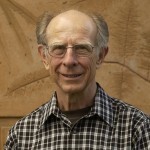 Two large contextual factors to the budget are that we have an aging population, plus growth needs to occur outside the traditional arenas of resource extraction and agricultural exports in a few chosen bulk commodities. Alan Kohler told us one night recently that Australia’s economic complexity was one of the worst in the OECD, about on a par with Kazakhstan, so there is plenty of scope for improvement. To prosper in the future we are going to need good social infrastructure that works in areas like health, education, skills, research innovation and justice as well as infrastructure in communications and transport. New Zealand has adopted a ‘social investment for their future’. They seem to be a bit smarter than we are in many areas of public policy. The LNP approach has two main aspects – reduce corporate taxation and limit the size of government which is seen as a burden rather than as an investment. Necessary expenditure is continually being cut. For example, in the NDIS, 10 per cent of plans are requiring a review almost as soon as they have been established. People are waiting nine months for a review, because the program is under-resourced. A Productivity Commission report had found more help at an early age saved the system money later. Examples like this appear several times a week, which makes me wonder whether the LNP has any grasp of what the country needs in the medium to longer term, and whether the current government is fit for purpose. As the budget issue plays out in the context of an election campaign it may come down to an auction on taxation. 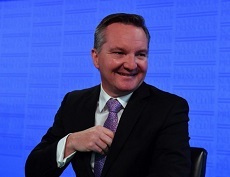 Phillip Coorey in Top tax rate of 49pc will stay until budget is in strong surplus: Chris Bowen. Bowen has defined a strong or sustainable surplus as 1 per cent GDP. The LNP budget will not reach 1 per cent until 2026-27 due to the impact on revenue of the three-stage income tax cuts. Labor aims to get to a surplus at the same time as the LNP, but plans to make it sustainable much earlier. Final figures will not be available until the election. Labor supports and almost doubles the first phase LNP budget tax cuts, from $530 to $928 for those on $50K to $90K. This phase is a tax refund at the end of the year, rather than a rate cut, so its effect does not pass on the higher income earners. The second phase involves lifting the limit of the 32.5% bracket from $87K to $90K immediately and then phasing it up to $120K. In this phase the 19% threshold will also be raised from $37K to $41K. It looks as though Labor will support this phase. The third phase sees this 32.5% bracket taken right up to $200,000, with the 37% bracket being eliminated entirely. It looks increasingly unlikely that Labor will support this, but will retain the 49% rate (with Medicare) for the top $180K plus bracket. However, Labor has a bigger warchest and is likely to offer bigger tax cuts than the LNP for middle Australia. Currently the top 20 per cent pay 78.7% of the tax. Under Labor this would lift to 82.7%, but under the LNP it would also lift to 81.3%. I think this if fair. Government is going to cost more in the future because of aging, because people want good services, which in any case are necessary for an improved economic future, and people are committed to assisting the disabled. Paying a little extra will not change the life-style of the top 20 per cent. I would suggest that it is untrue that Labor is ripping funds out of Australia’s institutions. Presumably the Greens will increase the welfare to the poor. They always have plenty of money to disperse in their budget calculations. 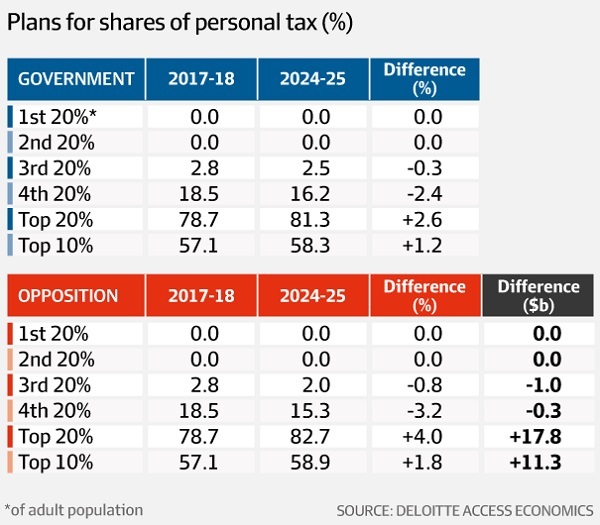 A couple of days ago Phillip Coorey looked at the possible future of the senate in relation to tax policies, suggesting thatLabor’s tax strategy will face its own senate ordeal. Labor has 26 in the senate, and the Greens nine. The LNP have 30 in the senate. Either way the going could be tough to reach the magic 39 votes needed. Of the 11 on the crossbench only Pauline Hanson, the Centre Alliance’s Stirling Griff and Rex Patrick and Cory Bernardi have six-year terms. Coorey says they are all essentially low taxers. Seven of them – Derryn Hinch, David Leyonhjelm, Fraser Anning, Brian Burston, Peter Georgiou, Steve Martin and Tim Storer – scraped in last time because they, or the disqualified/retired senator they replaced, were able to cobble together half a quota of votes as required in a double dissolution. unless Labor and the Greens boost their Senate numbers to a combined 39 votes at the election, Labor’s $220 billion war chest could be reduced by between $50 billion and $100 billion. That was before the Greens spoke. New Zealand’s Labour-led coalition government used its first budget to drive step changes in social and environmental outcomes. The investment approach to public policy has become the new orthodoxy for governance. The investment approach can be defined as using evidence to quantify a public problem and then fund interventions that are likely to improve outcomes and therefore reduce future costs to government. A pity the place is so cold. Other commentary includes Katherine Murphy Labor to promise bigger surpluses to buffer Australia against global economic shock. * I’ve used the phrasing from Phillip Coorey’s article. ** I posted a link to a transcript as well as the video at Australian politics.com, but on closer inspection it turned out to be the 2014 speech. I can’t find the transcript of the 2018 speech. Previous PostSaturday salon 19/5Next PostWill Labor’s budget dream team prevail? Back in the sixties I was paying a marginal tax of around 60%. My wife’s take on this was that it was tremendous that I was earning enough to be paying the top marginal tax rate. The better off would be happier if they focused on their after tax earning instead of how much tax they paid. I support the Greens position. We shouldn’t be cutting taxes and charges while so much of what our governments do is not done well because the government hasn’t raised enough money to do the job properly. 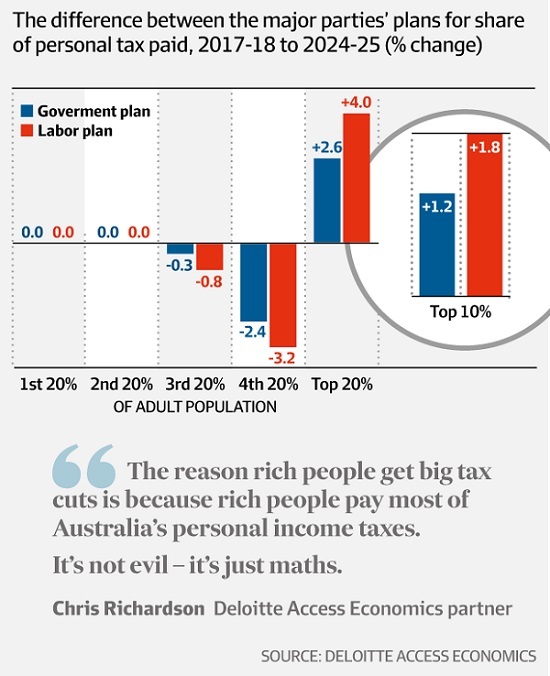 Chris Richardson pointed out a few days ago that 47 per cent of tax payers actually don’t pay any tax. While he should have specified income tax he makes an important point: Income tax cuts don’t help this bottom 47% . Time to start talking about “negative taxation” This means that the tax dept would start paying money to people with an income below some cut-off point. (Ex: Tax free threshold.) The payment would depend on how far the taxpayers are below the cut-off. ) May be more useful if it is combined with welfare as a loan functioning as a weekly advance on the expected negative tax. John, it doesn’t matter how much Government revenue rises every single year, and it does, it will never be enough for the greenies. And the ALP, as far as I’ve been able to see, have never and will never pay a single cent off our National debt. When they’ve actually gained a surplus, they spent it and then some. The repayments on it now are over one thousand millions per month. And this LNP have Buckley’s of getting a $12 billion surplus that goes totally on that interest just to see it remain stable. It may be ok for some to say “ I’ll be dead, I’ll not have to pay for that, I benefited from it and future generations can sort it out “. Sound familiar on another topic ? I had thought a “surplus” denoted a circumstance where spending is less than revenue. They would have a surplus after the spending was finished. !Please don’t lead us down a peculiar Venezuelan path Senor Maduro Meester Jump! Picture you constantly spending more than you receive. Constantly putting the difference on the credit card. Then one day you had the good fortune to see $100 cash in your hand rather than another deficit. But you don’t use that cash to pay down your credit card, you spend that $100 as a down payment on a new shiny thing for the kids. Your kids will inherit all your debts. But at least you got a “ thanks Dad!! “ for the kids that don’t understand they have to pay for it when they grow up. Do you see now ? Oh, you mean like Costello and Howard. BTW if you get a new shiny thing for the kids it seems fair enough that the kids inherit the debt. If you feel leaving a debt burden rather that a boosting inheritance is best for your kids, I’m not sure you’ll get what I’m saying. Jump: Howard and Costello wasted the income boost coming from the mining boom for tax cuts that didn’t provide any help for those at the bottom of the pile. They scrimped on things that would have put us in a better position than we are now. Jump, you seem to have based your hollow blog point on a misunderstanding (nothing new there). In no way am I in favour of the way Costello and Howard pissed away our money. As I understand it, John is talking about the revenue side of the Budget. Not national debt, not private debt, not payments for infrastructure or teachers’ wages or PBS medicines…. Revenue was coming in from all kinds of taxes and charges, but because of the mining boom it came in at a higher rate than usual. And that Govt gave a lot of that extra revenue back as “income tax cuts”. $ the capital gains tax rate was halved. Strangely, now, the current Federal Govt doesn’t seem to be getting away with its attempt to fake generosity to larger companies (in the little matter of their tax liabilities). Jump, it is completely irrelevant to quote Swan in 2012, unless to make the point that he was blindsided by crook Treasury forecasts. I honestly think Bowen has taken on board the notion that we need to wind down debt to be safe from the next black swan global event. Also by making changes to such things as negative gearing and dividend imputation he isn’t as dependent as ScoMo wage growth. Here’s Michael Pascoe What is really happening with wages growth: It’s not on how ScoMo’s budget strategy already looks stuffed. 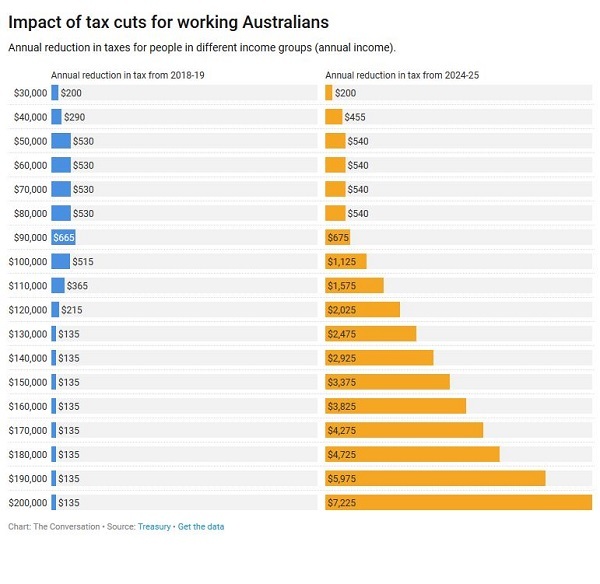 It wasn’t just tax cuts with Howard and Costello, it was middle class welfare and rorts such as changing the super rules for his rich mates. In one of my luckier transactions I sold 1,000 Leighton’s shares I’d bought for $1.28 for $57. On advice I put half into super and thus avoided capital gains tax completely. A few years later I took it all out of super again, tax free. Only possible thanks to Costello. BTW I put the other half into a company prices at $2.94. They almost immediately stuffed up and were languishing around 10 cents for years. Lately they’ve perked up to 20 cents but are now sagging again. I’m waiting for a takeover so I don’t have to pay brokerage. I think Jump’s real peeve is that his parents’ generation saddled him with debt – it’s so unfair! John, which mining boom ? The one that started in, according to the RBA, 2005 when the vast bulk of ALPs $92Billion debt had already been payed off. We only got debt free in 2006. Royalties, licence fees and GST don’t go on the Federal budgets revenue side, they are State revenues that certainly don’t go to paying off the debt. In any event, Swan had a bigger boom, higher mining investment, higher commodities prices, more mining employment and the highest terms of trade in Australian history. Yet spent the lot plus a racked up more debt. We only got debt free in 2006. Not according to this site, which demonstrates that total government debt is notably less than business debt. In any event, Swan had a bigger boom, higher mining investment, higher commodities prices, more mining employment and the highest terms of trade in Australian history. I believe he also had a GFC (whatever that is). Federal government debt zoot, please focus. And we went into the GFC in better shape than almost any other country in the world. Swan should be thanking Costello but he’s not honest enough. Several of the taxes I listed do indeed go into State coffers. The WA economy was going gangbusters, if I may coin a phrase. That boom was not confined within WA borders. FIFO workers from other States were cashing in, and spending much of their wages in their home States, paying GST, paying Federal Govt income taxes. Plenty of folks jumped on the gravy train: exploration companies, mining consultant engineers, export shipping enterprises, heavy machinery importers…. WA real estate prices rocketed, so banks and estate agents benefitted. The economy is a complex beast Jump. There were plenty of flow-throughs to Federal revenue. The cliche at the time was “Australia as a two-speed economy”: WA and Qld roaring along while we non-mineralised cousins faltered. A bit of truth there but not the whole picture. Keep working on your Utopia, brother. But I still don’t understand how that was justifiable or good for the polity. I’m not the one offering utopia, that can’t exist in any form of nature. I just want everyone to incrementally get better off. We just seem to disagree on the path. That said, as a self confessed pendant, you would appreciate accuracy and own up when you present inaccuracies. Thus you have, in a way, thanks. And what economic good did you choose to do with that windfall? No need for specifics, vague area description will do. Even Brian’s dud investment added to the “ gdp “ but sadly it didn’t grow the pie. If business debt is greater than total government debt then ipso facto it is greater than federal government debt. Why are you happy to foist private debt onto generations to come? Surely fiscal probity is necessary in all areas of the economy. Otherwise we’ll all be rooned. Pedants always reserve the right to point out the speck in someone else’s eye, first. Having trouble reading the keyboard: there’s a log getting in the way, here. Nothing specific comes to mind (no fancy car, no expensive overseas jaunt). Re-investment in another rental property, eventually. So: providing and maintaining accommodation, paying income tax on rental income; paying council rates, water and sewerage connection; paying fees to rental agents and insurance etc. ; fairly humdrum circulation of money through the local micro-economy in a regional town. The house is not negatively geared. Tenants are exceptionally good. House already existed, so we didn’t hire a builder. Sorry, Jump. Increased our own home’s solar PV from 1kW to 5kW late last year; installed by a local retailer. (Not a huge cost.) The batteries can wait. You might call this paragraph “virtue signalling”. I regard it as “thrift” and a solid investment. Income security allows us to volunteer locally which is one of the most rewarding parts of every week. Glad to hear you’re not seeking a utopia. I think you’ll find many other citizens want incremental improvements that they believe they can rely on. How do you know? No-one much reports what Swannie says, never did. I think he is congenitally honest and would recognise what Costello did to debt. Actually it did grow the pie and is still doing it, just not very profitably. The company is Boom Logistics. I bought it on the notion that when there is a gold rush on there will always be a need for picks and shovels. It supplies all the heavy gear that miners lease to dig stuff out of the ground. I bought it not long before the GFC, but the real story was that we had heavy rain in Central Qld and all the holes in the ground filled with water. It hasn’t paid a dividend for 10 years, and most of the brokers don’t follow it any more. Still on the ASX, but the Courier Mail doesn’t bother to list the price, so it’s completely unloved. In the post I made a link to a transcript as well as the video at Australian politics.com, but on closer inspection it turned out to be the 2014 speech. I can’t find the transcript of the 2018 speech.